SOLBET Mortar for thin ACC joints is the basic mortar for bricklaying. It is designed for joining wall components (both inside and outside) with the use of thin joint (which should have thickness from 0.5 to 3 mm in accordance with EN 1996-1). This makes an AAC wall uniform in terms of thermal properties, which means that a thin joint does not affect the formation of thermal bridges. In addition, thin joint means less technological moisture at the stage of bricklaying. Due to lower water consumption it is an environmentally sustainalble solution. SOLBET Mortar may be also successfully used with masonry units, other than AAC blocks, for example ceramic and concrete units. However, they must be characterized by high dimensional accuracy. 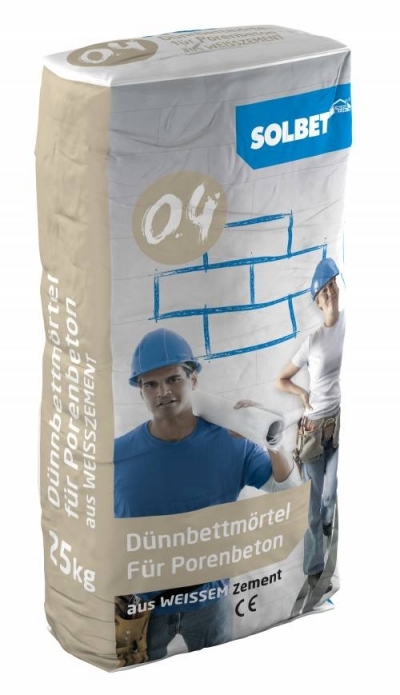 SOLBET Mortar is characterised by sufficient compressive strength (10 MPa), very good workability, frost and water-resistance and good adhesion to various masonry units. It is made in the form of a dry mixture of hydraulic binders, selected mineral aggregates and admixtures that improve technical parameters and working properties. storage: 12 months from date of production in sealed, original and undamaged packaging, in dry rooms (recommended storage on pallets). SOLBET Mortar has been awarded with the Certificate of Factory Production Quality Control 1487-CPD-73/FPC/07, as well as certificate of the National Institute of Hygiene no. HK/B/0577/07/2008.